My active set of computing devices has changed a lot during the last year. I started off with the usual arsenal of gadgets that you’d expect from an iOS developer: half a dozen old and new iPhones, several iPads, and a monster of an over-powered iMac to run Xcode, Photoshop, and the iOS Simulator - complete with dual screens. It was a stressful setup, and that’s without even mentioning OS upgrades. My current situation is very different. I’m no longer a developer, and I spend my days writing instead. My needs are modest. So, I’ve taken the opportunity to strip down my device inventory, and achieve a sort of zen simplicity of computing. I haven’t given up traditional computers, lest you think this is an “iPad is my office” testament. The truth is, my wife and I don’t really use iPads at all anymore, except as a recipe book in the kitchen. It’s been a year since we used one anywhere else in the house. We never, ever travel with them. We have no plans to acquire any more in future. When I started searching for a simpler setup, the first device I ruled out was a desktop machine, like an iMac or 15” MacBook Pro. I love having a fully mobile working environment, even if I do work in a dedicated home office most of the time. I do still have a iMac, but at this point it’s mostly a Software Update server and media library, and I plan to get rid of it next year. I still need a Mac computer, though. I never completely settled into using iOS for full-time writing, and I’m essentially married to both BBEdit and Scrivener at this point. Using an iPad (or an iPhone 6 Plus) as a work machine isn’t viable. There are just too many compromises. Likewise, I don’t want to spend any more time on my iPhone than I have to, and portability is by far the most important quality for me. I’d love a 5s-sized iPhone with a 6-style form factor and build. I hope that the iPhone 6 isn’t going to be the smallest available model in the future, but I suspect it will be. My entire computing setup right now is as simple as I can make it: an Air, and an iPhone. The Air is the ultra-portable 11” model, in its 2013 variant with astonishing, all-day battery life. I upgraded the CPU and memory to their maximum spec. The iPhone is a gold 5s, with Touch ID and a dual LED camera flash. They’re both small, light, durable, and they keep going for more time than I’m willing to spend with them. They’re not quite perfect to me, but that’s only because I know what’s possible, and the alternatives that exist. As I said, I’d be delighted if the 5s was thinner and a little lighter, and had slightly longer battery life. I’d also love it if the Air had a Retina display, without sacrificing its endurance. But those requests are just indulgences; both of these devices are already magical things. The iPhone 5s fits my (small) hands perfectly, and iOS 8 brings support for third-party keyboards with swipe input, finally letting me type quickly and reliably with one finger. It’s light and reassuringly solid, and disappears into my front trouser pocket. The screen is big, bright, and clear. The casing is elemental, stylish, and pleasingly reserved. I use it to triage email, check Twitter, and talk to my wife and my friends. It’s also my music player, fitness tracker, on-the-go task manager, games machine, backup e-book, and travel companion. I would feel naked without it. Watch, phone, wallet, keys, I whisper to myself as I pull on a jacket and head for the door. I’ve never owned anything that made me feel more empowered. 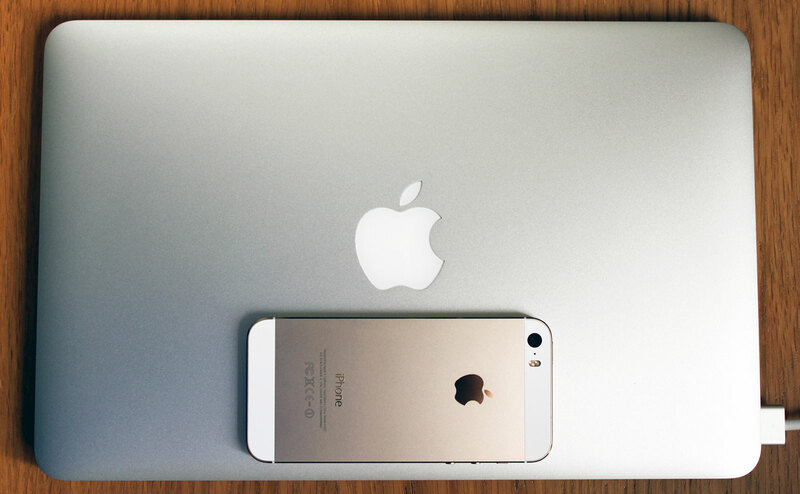 The MacBook Air is my favourite computing device of all. The shallow, quiet, soft-action keys are positive without being harsh, the trackpad is large and responsive, and the screen is wonderfully vivid even at 50% brightness. It’s silent and cool, exceptionally light for a laptop, and it’s as solid as the iPhone when the lid is closed. It also regularly runs for 12+ hours at a time while I’m working, without having to worry about plugging in the power cable. 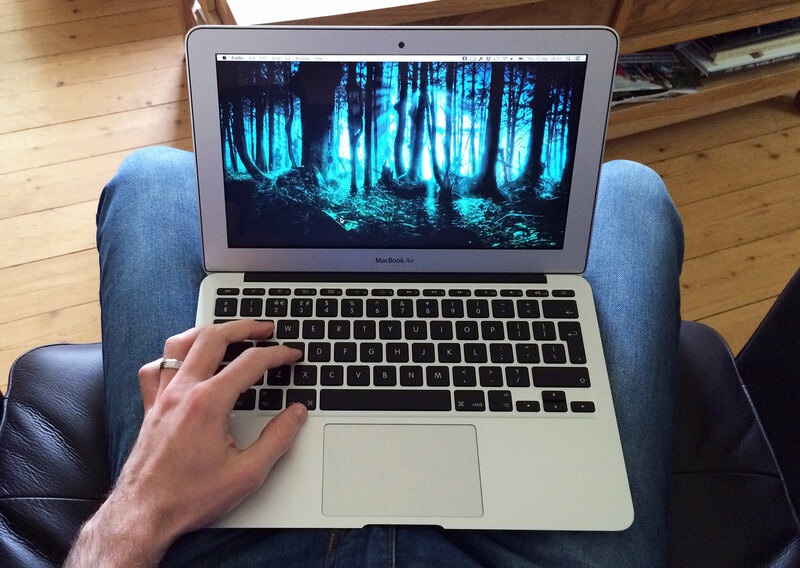 It’s the ideal writing machine, and the ideal writer’s laptop. I’ve never owned anything that made me feel more productive. With these two machines, I’ve managed to find the one-socket office. Any power socket, anywhere, is all I need. That’s a liberating truth. Focusing on these devices alone has been transformative for me, and their elegant portability has erased so much of the tension from my working environment. I feel light, and movable, and untethered. My burdens are fewer. My mind is clearer. The specific mix and models of your own computing machines will vary, of course, but the larger point is that we can regain control - and freedom - by paring things down. A tool should be an enhancement first and foremost, not a commitment. That’s the thing to ultimately ask when you’re deciding what to acquire, and what to remove: how does this fit me? Choose the things that let you move.